Previously we discussed how a company’s past success can lead to future failure. In this post, we discuss how to create future success by turning your corporate culture to competitive advantage. We’ll describe the detailed steps to defining a set of cultural values and clear examples of desired behavior that will go a long way towards engaging employees and helping to transform the company culture into one which supports your future direction. The first two steps of the process will be discussed in this post, and once you’ve used your corporate culture to competitive advantage, we’ll show you how to up the ante and turn your advantage into a competitive weapon. Missed out on earlier posts? Check out the first post in this series here and the previous post here. 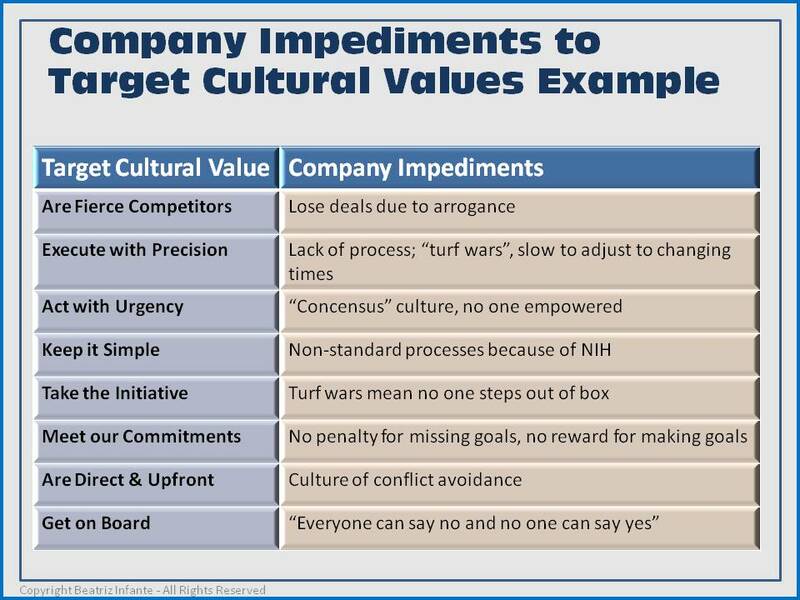 The first step in your cultural transformation is to identify the Target Cultural Values expected on the part of every employee, and define these clearly enough that most employees can understand. In general, short phrases with a one-sentence explanation are better than single words like “Quality” and “Teamwork”, all of which can have a multitude of meanings. You want to make sure that employees understand exactly what the requirements are, without room for “creative” interpretation, so stick with phrases such as “Act with Urgency” and “Be Direct and Upfront” that leave less room for ambiguity. This is the secret to turning corporate culture to competitive advantage. Step 1 focuses on identifying the cultural phrases, and Step 3 outlines the process of developing a sentence to further define the phrase. The in-between step identifies the employee context, without which Step 3 may provide a definition that is not well absorbed by employees. It is extremely important to undertake the identification of the cultural values together with your team because the process is necessary to the end result of turning corporate culture to competitive advantage. It is essential, especially in the beginning, to include employees who have been with the company a long time as well as the new blood you have inserted into the mix. The established employees are necessary because they will understand the history, causes, and nuances of the behaviors you are trying to modify; new members of the workforce are necessary because they bring fresh thinking to the mix. To a significant extent, the desired behaviors will be an outgrowth of the work you’ve done in the section on Creating “One” Team, and the closer you come to accomplishing this, the more accelerated the results will be. Which set of behaviors you ultimately choose will be a function of what the business needs going forward, as well as the unique mix of prior and new employees that are part of the core team. The second step is a “working version” used to derive the final value statement ready for employee training and company-wide proliferation. The purpose of the intermediate step is to identify the underlying root causes that inhibit the widespread adoption of the target cultural values defined above. In other words, the employee context must be considered along with any Corporate Core Value Confusion that exists in the company. Understanding the context from which an employee will evaluate or act upon a particular phrase is fundamentally important because a simple phrase such as “Act with Urgency” will be interpreted differently depending on the employee context. Only with the help of employee context can you turn corporate culture to competitive advantage. This is where having trusted employees who have been with the company a long time but are bought in to the transformation are essential. Identifying the impediments in the existing culture that preclude the adoption of cultural values defined above as the norm is critical. The cultural impediment may be a combination of factors, and each factor must be identified so the solution may be defined. To delve more deeply into the notion of context and root cause, if your cultural value is “Act with Urgency”, and employees leave a meeting without following up their action items, you must understand the root cause in order to figure out what to fix. Fixing the wrong root problem will only make things worse, not better. What are the potential causes of employees leaving a meeting with action items but then not acting on them? Possibly a culture exists in which there is a lack of accountability coupled with conflict avoidance coming from a misguided focus on “teamwork” which created a culture in which no one owned a decision, or its execution. Rather than everyone owning the decision, no one did. Alternatively, prior management could have been so highly changeable that employees decided it was better to “wait for the weather to change”, because they had wound up wasting effort on directions which were subsequently changed. In the first case, the company impediment would be “Consensus culture, no one empowered’; in the second case it would be “Employees don’t take management seriously, neither penalty nor reward for achieving tasks”. 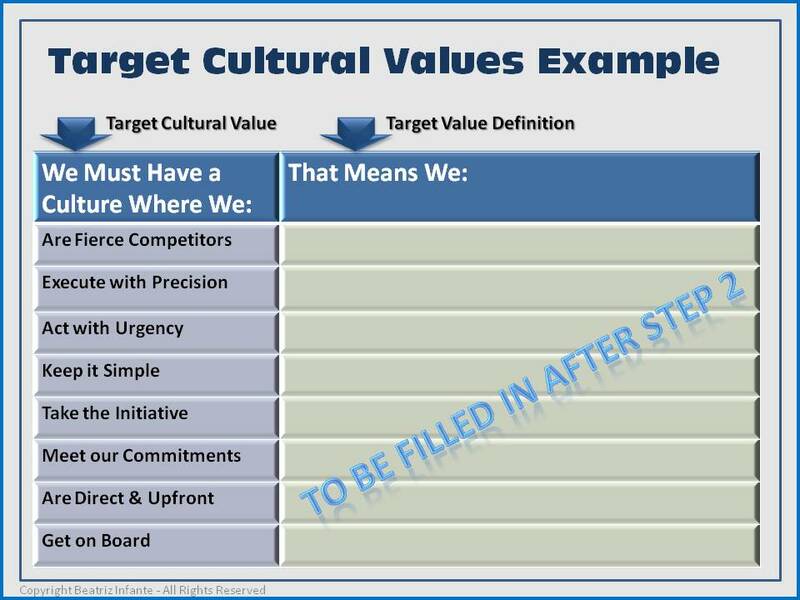 Now that you have your Target Cultural Values and your Company Impediments to Target Cultural Values defined, you can create the Employee-ready Target Cultural Values together with the all-important one-sentence definition of the cultural value using words and phrases that are meaningful in your particular employee context. Read on for the next blog post in this series. 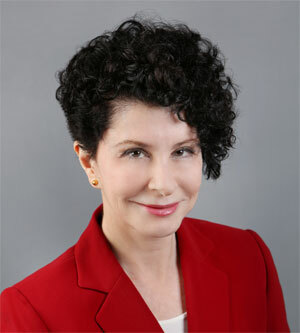 When facing challenging situations, seasoned management consulting professionals can make a difference between failure and success. BusinessExcelleration’s former operating executives have “been there, done that” through multiple similar situations and can bring a wealth of knowledge and experience and expertly apply it to your particular corporate transformation and help you create a high performance culture. Learn more about our services!